Now you can distribute a single SD or HD-SDI connection to up to 8 different SDI outputs at the same time! You get a true 3G-SDI design with fully re-clocked outputs and automatic switching between all SD and HD formats up to 1080p60. You also get support for all ASI, ancillary and embedded audio formats. Mini Converter SDI Distribution is the perfect SD/HD SDI distribution converter for when you don’t need the cost of the Ultra HD model! 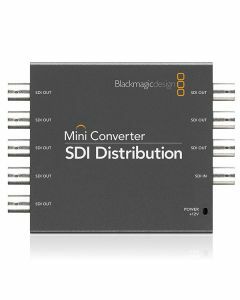 Blackmagic Design’s SDI distribution Mini Converter is one of the world’s most sophisticated converters thanks to its use of the latest 6G-SDI technology. Capable of automatically sensing the input video format and instinctively changing between essentially all SD, HD and Ultra HD video standards up to 2160p30. The SDI Distribution Mini Converter utilises advanced features such as redundant SDI inputs, re-clocked loop outputs, and full analogue and AES/EBU audio connections so you can convert video, as well as embed or de-embed audio. The Blackmagic Design SDI distribution Mini Converter uses a simple, condensed design that means it’s easy to use and incredibly dependable when used as part of a 24/7 operation. The built-in connections are quick to access and utilise standard cables, as well as the built-in mini switches which can be used to swiftly change settings. There’s even a diagram with switch settings printed on the back – you’ll never have to look for the manual. It’s now possible to distribute a single SD or HD-SDI signal to up to eight different SDI outputs simultaneously. Automatic switching between all SD and HD formats up to 2160p30 and a true 6G-SDI design with full re-clocked outputs both come as standard. Full support is also provided for all ASI, ancillary and embedded audio formats. The SDI distribution Mini Converter is the optimum SD/HD SDI distribution converter, without incurring the cost of the Ultra HD model. Auto detection of SD, HD, 2K, or 3G-SDI. 2K Format Support: 2048 x 1080PsF23.98, 2048 x 1080p23.98, 2048 x 1080PsF24, 2048 x 1080p24, 2048 x 1080PsF25, 2048 x 1080p25. SDI Auto Switching: Automatically detects SD, HD or 3G-SDI.